Buying a treadmill for your home is one of the best investments you can make for your fitness. A treadmill is an easy way to get started with home workouts. You and your entire family can benefit from having a treadmill at home. A few years ago, treadmills were simple. Nowadays, treadmills are complex machines with an overwhelming amount of features. It’s important to choose a treadmill that fulfills your needs and doesn’t empty your wallet. Before you decide what treadmill to buy, it is important to know which features to look for in a treadmill. Out of all the features, you can then decide which features are important to you. When you are buying an expensive product like a treadmill, buying the right brand becomes critical. A brand represents product quality, service levels and ultimately, your satisfaction. There are many good treadmill brands in India, and we discuss each of them in detail in a separate post. Click here to read about the top treadmill brands in India. If you have been to a gym and used the treadmill there, it probably was an electronic treadmill. Electronic treadmills have built-in motors that run the mat on which you can run/walk on. A manual treadmill is a treadmill which does not have an electric motor, and all the work to make the treadmill go has to be done by the user. Obviously, manual treadmills are much cheaper than electronic treadmills. If you have the budget, you should buy an electronic treadmill. We will cover manual treadmills and their features in a different post. You don’t want a treadmill that is cramped and unusable. Therefore, it’s important to know the area available to use on the treadmill. Obviously, the larger the running area, the better. Just make sure that you check this before you decide to purchase the treadmill, as Amazon and Flipkart have made the treadmill category non-returnable. Yes, it’s important to remember that treadmills on Amazon and Flipkart are non-returnable. That is why it is important to do your research beforehand. As you grow stronger by walking, one of the ways to keep increasing your strength is by increasing the intensity of the workout. Apart from speed, another way to increase the intensity of the workout is to increase the incline. The higher the incline, the higher the intensity of the workout becomes. Incline adjustment on modern treadmills can come in 2 forms. Manual or automatic. A manual adjustment means that in order to change the incline, you have to physically adjust the angle of inclination by adjusting the treadmill. In automatic incline, the angle inclination can be adjusted at the push of the button. No manual adjustment is necessary. Most commercial treadmills have automatic incline adjustments. From a usage perspective, the automatic adjustment is better. You can adjust the incline on the fly, even while running. To adjust the incline on a manual adjustment, you would have to step off the treadmill and adjust it manually. Obviously, the treadmills with automatic incline adjustment will be more pricey than treadmills with manual incline adjustment. As we mentioned, modern treadmills can do much more than just enable running. Most new treadmills have the capabilities of measuring your heart rate, calories burnt and BMI. Maybe they will also calculate our IQ’s in the future. While these are useful figures to know, the accuracy of these numbers is questionable. It’s understandable that it’s easy to measure your pulse in real time, the other statistics about your body require special equipment to be measured accurately. If you are serious about your fitness, then please do not rely on the stats reported by the treadmill. It’s better to buy a good fitness tracker to measure and track these. The results will be far more accurate. These are obviously, examples. The kind of programs that you will get with a treadmill will depend on the brand and model you buy. As for their usefulness, it depends. The settings that can be changed in the pre-programmed settings can be just as easily changed manually. The programs offer only a slight convenience. This is something many people don’t think of checking before buying a treadmill. Treadmills are well-built machines, but they still have a limit to how much weight they will support. This can be a wide range from 100 kg to 200 kg. If you are overweight, then it’s important to know how much weight your treadmill will support. Buying a treadmill which cannot support your weight is an easy way to lose money. How would you feel if the electric bill of using a treadmill caused you to lose more weight than running on it? Not good right? Then remember to check how much power your treadmill motor uses. A high powered motor will shoot up your electric bill. Treadmills, like cars, have a maximum speed on which they can operate. A range of speed that a treadmill can operate may be 14 Km/h to 20 Km/h. If you plan on running really fast, then a faster treadmill is the one you should choose. As with every machine with moving parts, treadmills also require maintenance. The most important part that needs to be taken care of in a treadmill is the running area lubrication. The rollers on the treadmill can get rusty and cause problems. Some treadmill models have auto-lubrication feature. These treadmills will not require maintenance. Other treadmills require manual maintenance and will have to be lubricated regularly. To know how frequently you need to lubricate your treadmill, check the manufacturer documentation. Also, some [treadmill brands] will also bundle lubrication fluid when you purchase a treadmill. Price matters. Depending on your budget, you may see a number of options for buying a treadmill. A decent treadmill can cause anywhere from 25,000 to 1,00,000 Rs. 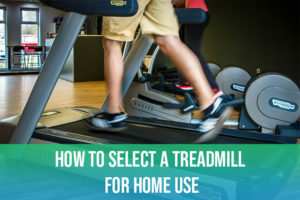 We hope that with this information you feel more confident about choosing a treadmill for your home. Even after this, if you have any questions, feel free to ask us in the comments.